Winning teams normally have set plays, run a organized offense and play splendid defense. 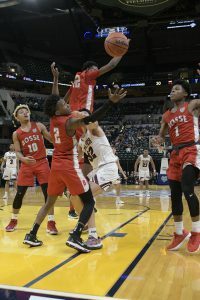 Those all were in clear view in the opening night session at Banker’s Life Fieldhouse on Saturday night at the 108th Annual Boy’s Basketball State Finals presented by the Indiana Pacers and Indiana Fever. Head Coach Mark Galloway’s Eagles were rocked at the start of the game with a quick outburst by Evansville Bosse’s seniors, 5’9 Mehki Lairy and 5’11 Jaylin Chinn putting a quick four points before Culver answered back with a tip in by 6’4 Junior Amari Curtis. Culver would then pull into the lead and never really look back. By the end of the quarter the Eagles would open a 22-8 first quarter lead. 6’1 Junior, Ethan Brittain Watts would show his prowess as he dominated the Dogs with his four of seven field goals, including two of three behind the arc ending in 10 points. Coaches son, 6’4 Sophomore Trey would give ample support with five points. Chinn and Lairy scored all eight Benjamin Bosse first quarter points. Bosse would make a bit of comeback in the second stanza as they outscored Culver 15-10 narrowing the margin to nine at the break. Mehki Lairy scored seven more points in the quarter to end the half with fifteen. 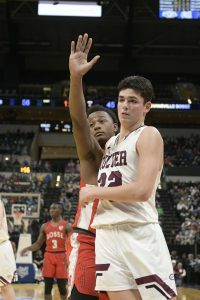 The second half saw Culver pull away by outscoring Bosse by six 32-26. Watts scored 20 for the victorious Eagles with support from Galloway and Deontae Craig both tallying 14 a piece. Lairy led all scorers with 28 while Jaylin Chinn would be the only other Bulldog in double digits with 10. 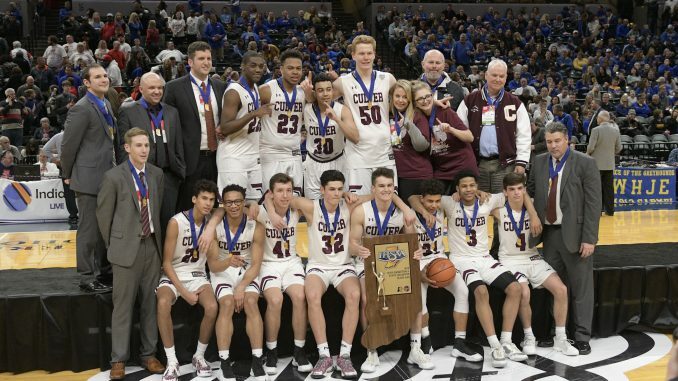 This is Culver’s first basketball Class championship. The stat line highlighted the outcome of the game as Culver shot 38% to Bosse’s 34%. Culver committed only 18 fouls to Bosse’s 24. 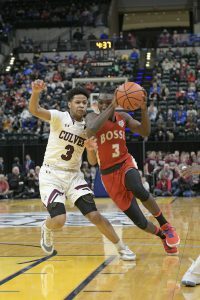 Culver had a team high eleven assists to Bosse’s three and the final stat with clarity was Culver’s ten turnovers to Bosse’s 18. Evansville Bosse’s Jaylin Chinn earned the Arthur L Trester Mental Attitude Winner.